Blue elf aloe vera is a perfect succulent for containers, well-lit indoor spaces and well-draining landscape beds. The gray-blue leaves are very striking in the landscape and develop an attractive red cast in sunny locations. The leaves have spine like appendages but are soft to touch, which makes this a perfect substitute to other spiny agaves and yuccas in high pedestrian traffic areas. Blue elf aloe vera is also clumping and can be divided once established. The red flower spikes contrast beautifully against the foliage coloration. Each plant rosette produces a flower spike during early winter through spring; and occasionally throughout the rest of the year. 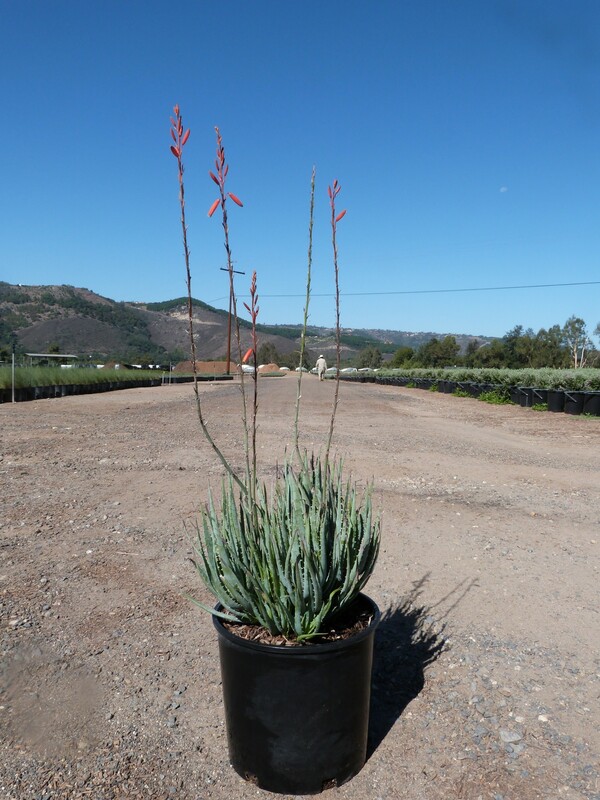 The flowers of this aloe are highly sought after by hummingbirds and other pollinators so they’re a good addition to wildlife friendly plantings. Thought drought tolerant, this aloe does best with regular watering during the heat of the summer. Plants can tolerate some shade, especially in warmer regions. Be sure to plant your aloe in containers in cooler regions to prevent damage or death from cold temperatures.